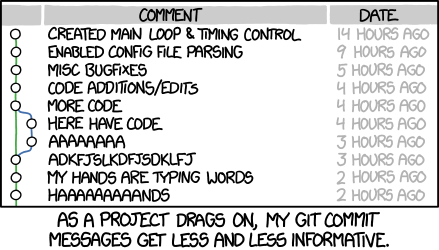 If you haven’t given much thought to what makes a great git commit message, it may be the case that you haven’t spent much time using git log and related tools. There is a vicious cycle here: because the commit history is unstructured and inconsistent, one doesn’t spend much time using or taking care of it. And because it doesn’t get used or taken care of it, it remains unstructured and inconsistent. But a well-cared for log is a beautiful and useful thing. git blame, revert, rebase, log, shortlog and other subcommands come to life. Reviewing others’ commits and pull requests becomes something worth doing, and suddenly can be done independently. Understanding why something happpened months or years ago becomes not only possible but efficient. Most programming languages have well-established conventions as to what constitutes idiomatic style, i.e. naming and formatting and so on. There are variations on these conventions, of course, but most developers agree that picking one and sticking to it is far better than the chaos that ensues when everybody does their own thing. Tip: If you’re having a hard time summarizing, you might be committing too many changes at once. Strive for _atomic commits_ (a topic for a separate post). Each of the seven rules you’re reading about right now are written in the imperative (“Wrap the body at 72 characters”, etc). In most cases, you can leave out details about how a change has been made. Code is generally self-explanatory in this regard (and if the code is so complex that it needs to be explained in prose, that’s what source comments are for). Just focus on making clear the reasons you made the change in the first place—the way things worked before the change (and what was wrong with that), the way they work now, and why you decided to solve it the way you did.